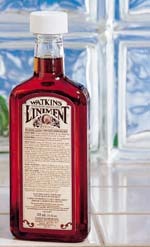 For Goodness Sake... Watkins Liniment! Yes, you can still get Watkins liniment! Watkins liniments have been used and trusted for pain relief for over 140 years. 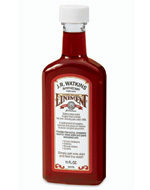 Try Red Liniment the very first product made and sold by J. R. Watkins in 1868 or the popular White Cream Liniment. I'm often asked which one is better? Well, they are both good, some folks prefer the red and others prefer the white, but everyone seems to have their favorite. Order your Watkins liniment in the Watkins store or go here to request your free Watkins full product catalog and order by mail or phone. What is Liniment Used For? How does liniment work? Liniments contain ingredients that when rubbed over the affected area of your body cause a mild irritation or a sensation of heat which may bring more blood to the painful or stiff area. The active ingredient in our legendary Red Liniment is camphor, from an Asian evergreen related to cinnamon. Together with the red pepper extract capsaicin, it works by stimulating nerve receptors that feel heat, masking the feeling of pain and relieving your discomfort from minor muscle pain, soreness and stiffness. Simply pat on or rub in gently to the affected sore muscles or aching joints and you will immediately start to feel the warming relief, repeat application at needed. Oh, oh are you coming down with something? Beat that nasty bug with a liniment bath. Add 2-4 tablespoons of red liniment your bath water. This works especially well if you are feeling achey. After your liniment bath, wrap up well, with lots of warm blankets and have a good sleep. This liniment was once proclaimed to be a cure for man or beast. Today, knowledgeable horse owners still use and trust Red Liniment, as warm up before excersing their horses, and to reduce temporary muscular soreness and stiffness from exertion, and/or joint pain due to arthritis. Ideal for horse's leg care, including tendonitis, shinbucks and sore muscles. Give your horse a refreshing and invigorating bath after his work out, mix 2-4 tablespoons of liniment in a pail of warm water. Sponge on, shampoo and rinse off. Your Pony will feel great. This popular and effective pain relief formula uses natural evergreen-based counterirritants to provide temporary relief from your rheumatic pains and aches, as well as muscle strains, aches and soreness caused by exertion. Pat on the affected area for immediate heat. Reapply as needed. Important Note: Avoid getting either of these liniments near the sensitive eye area. It's a good idea to wash your hands well with soap and water after applying. Information presented on this site is for informational or entertainment purposes only. These statements have not been evaluated by the Food and Drug Administration and are not intended to diagnose, treat, cure or prevent any disease. Always consult your healthcare or medical professional for advise. 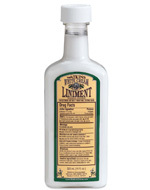 The newest addition to the Watkins liniment line has been extremely popular since it was introduced. 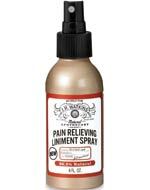 Watkins Pain Relieving Liniment Spray has the pain-relieving properties of Watkins Liniments and the penetrating vapors of our Breathe Easy Relief Mist in a convenient, fast-acting spray. Menthol and camphor provide you with quick, relief from sore muscles, aches and arthritis pain. You'll find the eucalyptus and thymol add a pleasant, soothing, purifying aroma. Shop for your Watkins liniments in our safe, secure Watkins store or request your free Watkins full product catalog and order by mail or phone. Do you have something to say about Watkins Limiments? Which is your favorite? We'd love to hear from you!